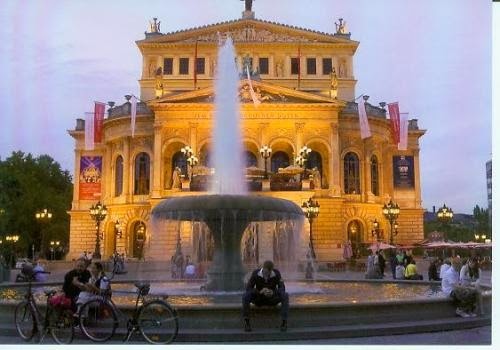 Postcard DE-3080344 shows Opernplatz (Opera Square) in front of the Alte Oper (Old Opera), a concert hall and former opera house in Frankfurt am Main, Germany. The original opera house was inaugurated in 1880 with many important operas performed for the first time. It was destroyed by bombs in 1944 during World War II. It was rebuilt over the time in the 1970s, and re-opened in 1981. With a new Frankfurt Opera and Play House already opened next door to Schauspiel Frankfurt in 1951, the newly restored building on the site of the original opera house was always intended as a concert hall. It has hosted all sorts of entertainment since.